Brendon McCullum had a long and successful international career. He made his ODI debut back in 2002 against Australia and two years later, his Test debut against South Africa on 10th March 2004. After 101 consecutive Tests, he finally called it quits against Australia in 2016. His numbers with the bat neither add up to amounts of Sachin or Lara nor does he average in the 50s like Kumar Sangakkara. Even when you think of wicketkeepers, names such as MS Dhoni or Adam Gilchrist pop up in the mind. But records such as the fastest ever Test hundred in his last Test, most numbers of six (101) in the Test matches, and most consecutive Test appearance with 101 Tests meant he had made a name for himself in the sport. But, forever, the world will remember the way he led, conducted himself and batted in the Cricket World Cup 2015. 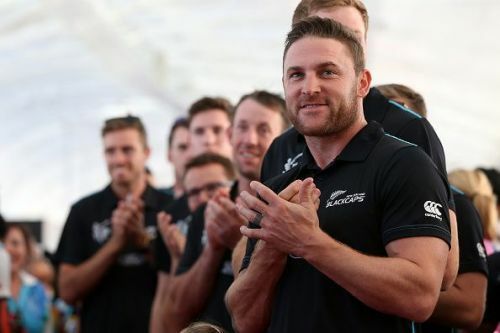 Right from the moment, McCullum launched his first ball of the World Cup over extra cover for four to tearing apart teams such as England, Australia, Sri Lanka with his captaincy and batting. Baz made the world stand up and not just salute the way he played but, more importantly, the team. McCullum’s strategy was to dismiss his opponents inside 50 overs – well inside. In the group stages, Blackcaps bowled out Australia for 151 in 32.2 overs, and England for 123 in 33.2. Both the times he delivered the knockout blow by bringing back one of his strike bowlers early for a second spell, while the new balls were still swinging. An act yet to be duplicated by any captain till now. Tim Southee singlehandedly destroyed England's batting with a spell of seven for 33, Trent Boult destroyed Kangaroos with five for 27. In return, when Kiwis came out to bat, McCullum ensured to break the spirit of the bowlers by smashing them all over the park as he scored 77 runs off 25 balls against England 24 balls 50 against Australia, and 49 balls 65 against Sri Lanka. Against Sri Lanka, in the eighth over of the match, bowled by one of the best, Lasith Malinga, McCullum thumped three fours, and a six as it yielded 23 runs making those series of assaults in the group stages most brutal till then. The cut shot, whack off Stuart Broad, upside down defence over the third man and slog over the bowlers head were few great shots he would go on to play. The likes of James Anderson, Mitch Johnson, Stuart Broad, Steven Finn, Mitch Starc were defenceless to Mccullum's counterattack. None of the captains, be it Clarke, MS Dhoni, AB Devillers could inspire the team with their batting as did Mccullum. But the foundation for such an explosion was laid much earlier, as a year before in 2014, Mccullum had a landmark season where he went on to record first Test triple century by a New Zealander (302). He continued to bludgeon records as he hit a double-ton off just 186 balls against Pakistan in Sharjah, UAE. In the Test series against Sri Lanka, later the year, he came close to breaking the record for the quickest double ton in the history of Test cricket before he was dismissed for 195 off just 134 balls. Apart from achieving those mindnumbing heights in 2014, McCullum's decision to call back Grant Elliot and Luke Ronchi from nowhere in the team paid dividends as they went on to play an essential part in CWC 2015 WC. At one stage before the start of CWC, it looked like McCullum and Kane Williamson would get the job done and if not, then Ross Taylor. But then you had Corey Anderson, Luke Ronchi, and Grant Elliot that made the team unbeatable on paper. And so was the case when they played in New Zealand before bowing to the might of Australia in their backyard. But the best perhaps was reserved for the semi-final as Kiwis chased down 299 in 43 overs with Mccullum leading from the front with 59 off 26 balls and Grant Elliot finishing the innings off the penultimate ball with a six off Dale Steyn to take New Zealand to its first ever finals of ICC CWC. In a time where leaders and groups are under a constant scanner, Baz recreated the template for leadership which can be referred to for generations to come. Though Mitch Starc won the prize for the man of the tournament because of his ability to churn out wickets on batting friendly wickets, one man who stood apart due to his attacking and bold captaincy and lighting up the stand with his batting, Brendon Mccullum, should have been the man of the tournament. It should have set precedence for the leaders to follow and ICC missed a trick there. In a generation where leadership has come under the scanner, Brendon Mccullum could have inspired leaders from there on.